GodWebStarbuck's Redeemed. The coffee giant's Christmas Blend hits Christian critics head on. HomeStarbuck's Redeemed. The coffee giant's Christmas Blend hits Christian critics head on. After suffering stiff criticism from some Christians for eliminating snow flakes from it seasonal coffee cups, the caffeine giant has come out with its Christmas blend 2016. No punches pulled here, fellow Christians. Starbucks doesn’t resort to euphemisms like “holiday blend,” or “winter blend.” It’s the flat out Christmas blend at Starbucks. Why aren’t the Christian critics cheering? Even the baby Jesus is pumped! Footnote. 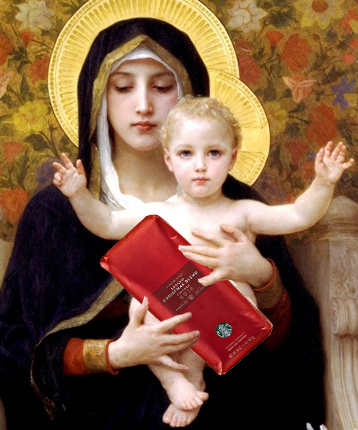 It is curious that the Christian critics of Starbucks didn’t complain about Starbuck’s choice of colors. The seasonal colors for Advent and Christmas are NOT red and green. Advent is purple or blue, Christmas is white or gold. Meanwhile red is reserved for Palm Sunday, Holy Thursday, Pentecost, All Saints Day and Thanksgiving. Just Sayin.